Long before I started recognizing the symptoms of Alzheimer’s, I learned about the virtues of the “Mediterranean Diet.” When I joined the Massachusetts Municipal Association as an editor, reporter and project manager in 2005, I was introduced to the MMA’s insurance wing: The Massachusetts Interlocal Insurance Association—MIIA, for short. One of MIIA’s role’s is to promote healthy habits among public-sector workers, such as police officers and firefighters. The premise is that healthier employees help keep down insurance premiums for cities and towns. If there is something like a Mediterranean gene, I would likely have it. And with those of us who have Alzheimer’s disease, consuming olive oil on a daily basis is good idea. I happen to like the taste of olive oil, especially when I have a fresh loaf of crusty bread from a bakery. I sop up the excess oil with the bread. And when I prepare salmon, or other fish, I always chop up at least one clove of garlic. What prodded my curiosity about olive oil was research in the science journal Nature: “Over the past two decades, substantial research has recognized that “chronic [i.e., “steady”] exposure to the Mediterranean diet is beneficial with respect to reducing the incidence of cardiovascular diseases and metabolism syndrome.” The Nature article’s main point is that, unlike olive oil, canola oil falls short of the threshold to be useful for people with Alzheimer’s. But it’s worth noting that the price differential between olive oil and canola oil is not radical—at least if you shop at the Market Basket in Somerville, where most items are cheaper compared to other grocery-store chains in the Boston area. And since I left the MMA in the summer of 2015, I’ve had ample time to eat well—and slowly. Of course, it also helps to like the taste of olive oil, as I do. Not everyone does. In terms of efficacy, the Nature article stated, “Over the past two decades, substantial research has recognized that chronic [i.e., exposure] to the Mediterranean Diet is beneficial with respect to reducing the incidence of cardiovascular disease and “metabolism syndrome”—such features as high-blood pressure and high cholesterol, the study noted. More relevant to my purpose, longitudinal studies and clinical trials have shown that adherence to this type of diet is associated with slower rates of cognitive decline and Alzheimer’s itself. And If you don’t like the taste of olive oil, just regard it as a kind of medicine, with a wealth of research backing its efficacy. One of the distinctive aspects of Alzheimer’s is that no two people exhibit the precise same symptoms. That was one of the key points in a speech by Dr. Brad Dickerson, a behavioral neurologist at Massachusetts General Hospital. I understand Dickerson’s comment pertaining to the complexity of the human brain and the nervous system, compared, to, say, heart disease, which in recent decades has become a far more manageable condition. In a practical sense, Dickerson noted that biomarkers can help doctors determine whether patients will stay in the mild cognitive decline or advance into full-blown Alzheimer’s disease. “We actually do a pretty good job with the tools that we have now,” Dickerson noted. And there are now specialized amyloid PET scans involving biomarkers. In some cases, people have a 90 percent chance of developing Alzheimer’s. But if individuals knew well ahead of time that they were at risk of Alzheimer’s, they could change their lifestyles in terms of exercise, diet, sleep habits and other factors. 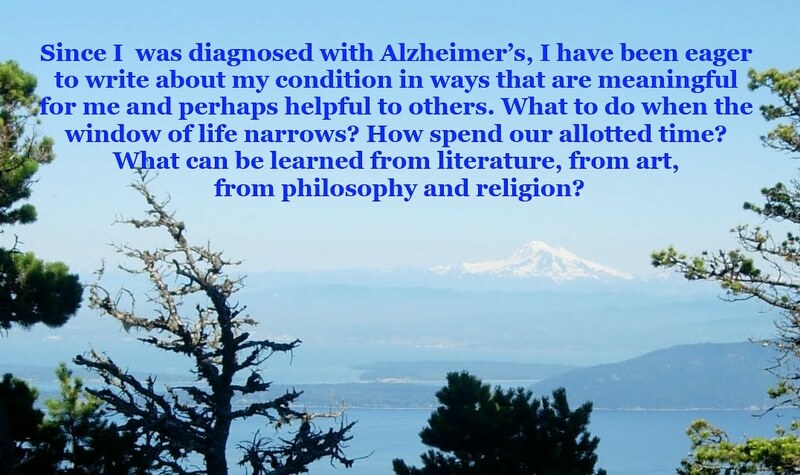 One question asked of Dickerson concerned the very broad life range, post-diagnosis. “And as anyone who has spent time in a support group for people with Alzheimer’s, or in a group for their care partners, the progress of the disease can vary widely. “The bottom line is that Alzheimer’s is a heterogeneous condition,” Dickerson stated. “The speed can be very different among individuals.” The amount of shrinkage in the brain varies widely as well. Dickerson also noted, pointedly, that no new Alzheimer’s drug has been approved for roughly fifteen years, despite the substantial money that has been raised, from both private and public sources. And, as we learned about a year ago, there was hope that an Eli Lilly drug candidate might slow the pace of the disease. That, in itself, would have been a very encouraging step. But that, too, went by the boards. Still, for those of us in a relatively early stage of the disease, there is still hope for a breakthrough.